The latest release from Nikko.Z's Dopamine Music finds the label showcasing new interpretations of Paul Deep's 'Consciousness State' EP. Originally released in July of 2017 it proved to be one of the Argentinean's strongest releases of year, earning support from Sasha and Armin Van Buuren. Now Dopamine Music calls upon Paul Kardos, Da Luka and Soulkeys to reinvent the EP for 2019. 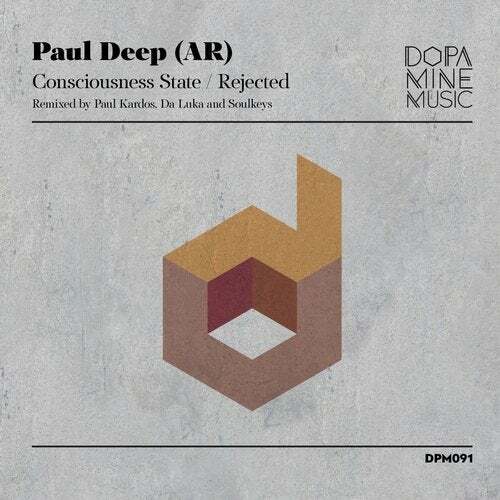 The release begins with Paul Kardos providing the lone interpretation of 'Consciousness State'. The Hungarian artist has long since solidified himself amongst his country's top progressive house talents. Releases on Clubsonica Records, Movement Recordings and Perspectives Digital, coupled with support from Hernan Cattaneo and Nick Warren made for a sensational 2018. Now beginning the new year on a strong note, Paul delivers a stunning rendition of 'Consciousness State'. Following an otherworldly intro the piece builds in methodical fashion with driving beats, luminous themes and a strong rhythmic core. A gaseous break melts down to a reservoir of fragmented melodies, ultimately highlighting the piece before a charming build and stellar apex ignites a chugging finale. Providing the first interpretation of 'Rejected' is Da Luka who returns to the label for his second appearance. The Albanian artist made his debut on the Greek imprint in April of 2017 with his 'Chiron' single. Subsequent releases on Balkan Connection, Soundteller Records and Stripped Recordings have all be hugely impressive, making Da Luka one of progressive music's most intriguing artists. Now returning to Dopamine Music he turns in a superb remix of 'Rejected'. Backed by a tough yet fluid groove, it's detailed percussion and hypnotic arps bring a fiery energy to the piece. Buzzing synths soon rise to prominence; rough, rugged and loaded with character they play off the pristine arp perfectly, before a quirky lead theme fully saturates your senses during a monumental break. The release concludes with Soulkeys making their label debut and providing the second and final interpretation of 'Rejected'. Hailing from the progressive music hotbed of Argentina, Francis Di Rosa and Juan Cruz Dangelo make up the Soulkeys production duo. Appearances on Beat Boutique, Movement Recordings, Soundteller Records and Stellar Fountain along with support from Hernan Cattaneo have make them one of their country's top up and coming duos. Now debuting on Dopamine Music, they round out the release with a top notch interpretation of 'Rejected'. Anchored by a spacious groove and layered beats, it's a creation to send people home with a smile. An evolving storyboard is perhaps it's strongest suit as tranquil tonal themes and ghostly vocal pads lift the vibe higher, before a well crafted break allows for moments of tension and reflection. A perfect way to cap off a superb remix collection from Nikko.Z's Dopamine Music, who continue a strong start to the new year.